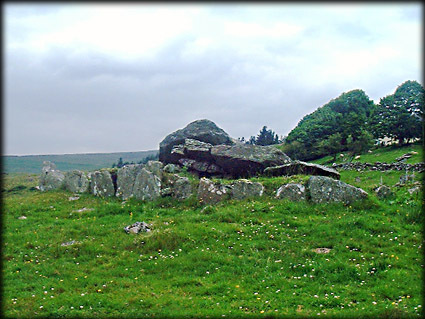 Known locally as the Giant's Grave, this national monument is actually a fine example of a Wedge Tomb, a passage set into a mound tapering to a point, hence the term wedge. There are many wedge tombs to be found in Ireland especially around Co Clare and Co Sligo and these are usually dated as Bronze Age. Not to far from this site are another few excellent tombs. Some other examples of wedge tombs on this site include Lough Gur, Rathfranpark and Labbacallee in Cork. Location: About two miles west of the village of Coolaney in County Sligo, take the Cappagh road from the village, drive straight on till you come to a sharp left hand turn, there is a minor road going straight on, you take this road, approx 500 yds on your left you will come to a farmhouse the tomb is in the second field to your left.